Carter Center long-term observers in Sudan, who have been deployed since August 2009, will soon be joined by a full delegation to observe the country's April elections. In teams of two, long-term observers have assessed pre-election developments, including voter registration in December. They face many challenges in their work but also have a unique opportunity to get to know the people and the places to which they are deployed. In Juba, The Carter Center is joined by an observer team from the Norwegian Resource Bank for Democracy and Human Rights (NORDEM). Bror Gevelt, a former Norwegian Air Force officer, and Magnhild Norgard, a former teacher and head mistress, spend hours per day in their vehicle to check on electoral preparations. In the five weeks of voter registration, the team traveled thousands of miles, often for 11 hours a day, to remote, virtually inaccessible parts of South Sudan. 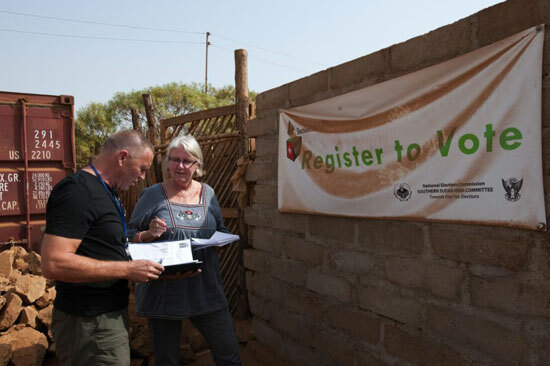 Norwegian international election observers Magnhild Norgard (right) and Bror Gevelt at the offices of the State High Election Committee in Juba, South Sudan. "We were impressed most with the peoples' enthusiasm for the elections," said Norgard. "Once they got the information – from their chiefs and church leaders – the communities mobilized well and were excited about this, their first multiparty election in 24 years." The team arrived to Juba in October and has felt welcomed there, explaining that people have given them open access and appreciated the international presence. "People relate to The Carter Center because of the success of the health programs here," said Norgard, "and we benefit from it. Jimmy Carter is well respected. He's recognized as neutral, and that the Center's health efforts are doing good things for the people of Southern Sudan." Magnhild Norgard and Bror Gevelt meet with Sudan People's Liberation Army member Magdalene Biato Ariol (far right) and United Democratic Front member Najat Sule, two of the "South Sudan Women in Political Parties" group who came together to encourage women to register to vote. Read more about the Center's efforts to eradicate Guinea worm disease. "One of the biggest challenges here is the security situation," said Gevalt, "not only for the communities, but also for us as we have to abide by U.N. safety rules. There are traditional conflicts over land and cattle and inter-tribal conflicts. Tribal affiliation is deeply rooted, more so even that the wider political affiliations. In 2009, more lives were lost here in South Sudan than in Darfur, and then there's the side effects - around 250,000 people were displaced last year." 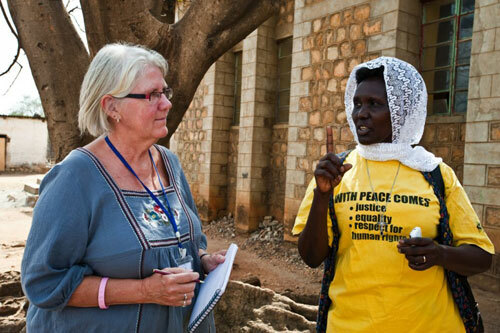 Magnhild Norgard with SPLA member Magdalene Biato Ariol, whose "South Sudan Women in Political Parties" group achieved a 75 percent success rate for voter registration in their areas. However, for Gevalt and Norgard, the work is rewarding in many ways. "We'll drive two hours to reach a really remote village," said Norgard, "and the people greet us with 'We're so happy to see you. Now we understand that this is a real election and it will really happen!'" Learn more about how the government of Norway supports the work of The Carter Center.